When an enterprise decides to outsource its customer-relations management tasks to a virtual assistant service provider, they usually have a higher expectation. They hire a person with intense technical knowledge who can create extraordinary customer experiences. Along with various business tasks that a virtual assistant these days are capable of performing, they can also be specialists who can take care of end-to-end CRM functions. In this article read about the roles of CRM specialists and a few best CRM software used by them. Who is a CRM specialist? A CRM specialist is a pro in sales, customer service and technology used in these sections of a company. They are capable of predicting what can go wrong or what suits the best at the bigger picture of CRM from start to finish. They work with CRM automation software to handle customer interaction, automate sales, manage client database, support vendor/partner relationships and so on. A CRM specialist has an eye for detail, exceptional interpersonal skills and is an expert in pulling marketing reports from the CRM. Their contributions definitely affect the efforts of the sales, customer service, and marketing teams. Can a virtual assistant be your CRM specialist? • Taking responsibility of the entire CRM system. • Integrating various reports and creating a clear analytical detail. • Skill to resolve issues tactfully. • A complete professional who can handle marketing, sales, customers, and management requests. • Narrowing communication gaps between sales and marketing. • Great communicators who can pitch company requirements to the prospects and are capable of being a catalyst to sales closure. • Train others who are handling CRM platform. • Maintain CRM and keeping it error free. • Update himself/herself on new CRM advancements around the globe. • Excellent problem-solving abilities and logical reasoning skills. It is a common knowledge that a CRM software facilitates a better way to manage customer relationships and interactions to drive sales success. All the efficient CRM software can give a clear overview of the customers. There are many CRM software released by various companies every year. Each one of them comes with special benefits which are good for a particular kind of business. They are designed to cater according to the company size. While CRMs for startups intend to avoid complexity, the ones designed for small businesses would come with other features like affordable prices and intend to create sustainable growth. However, it is mostly small businesses that rely big on virtual assistants for their enterprise growth. So, the CRM platform should be inexpensive to start with. Recently, a leading digital resource for small businesses named Fit Small Business has listed the Best CRM for 2019, which is a truly informative read. If in 2019, your business goal is to have a strong customer relation bond and you lack the right resources; you don’t have to quit from your plans, the smarter option would be to outsource it to an efficient CRM specialist. 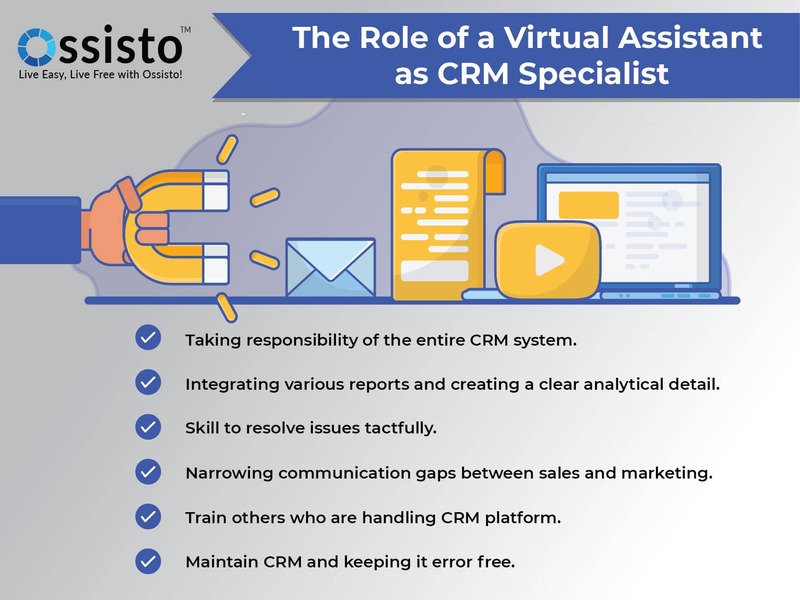 At Ossisto, we provide all kinds of CRM solutions.